Summer is here and with summer comes the effortlessness, that brings us great spirit and the joy with being creative. 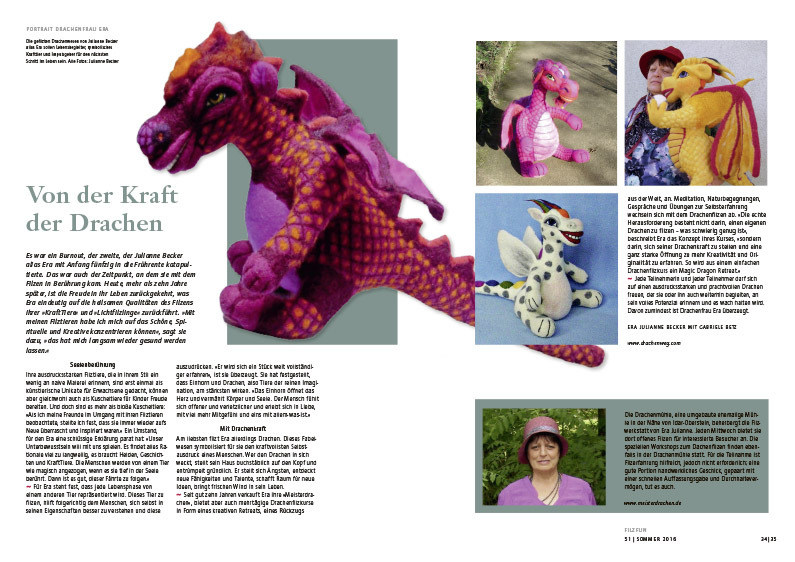 Many beautiful, amazing and creative things of the felter’s world await you in this summer issue. Accompany us on walks through studios of imaginative felt artists, look forward to exhibitions worth seeing and read about exciting projects, workshops and classes. Elma Haneda’s needle felted wool-paintings remind us of classic oil paintings. Her preferred subject is the human face and facial mimicry, which she uses as means of expression for her finely nuanced picture contents. The Dutch felt artist Elis Vermeulen loves the tactility of felt. She sees herself as a storyteller who likes to invite the viewer to interact with her creations. 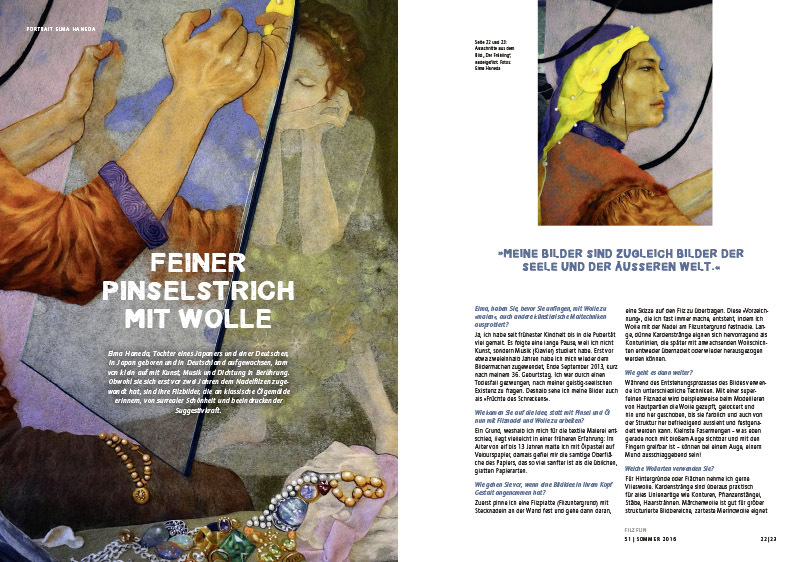 Edith Hofer lives in beautiful South Tyrol, she dedicates herself to felting individual clothes and accessories. 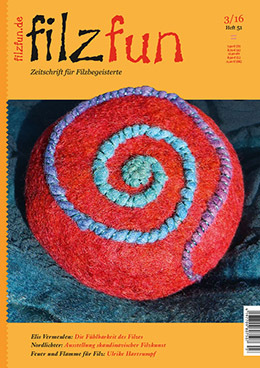 One of her hand felted »Talking Pads«, a worry stone, graces the cover of the summer issue. 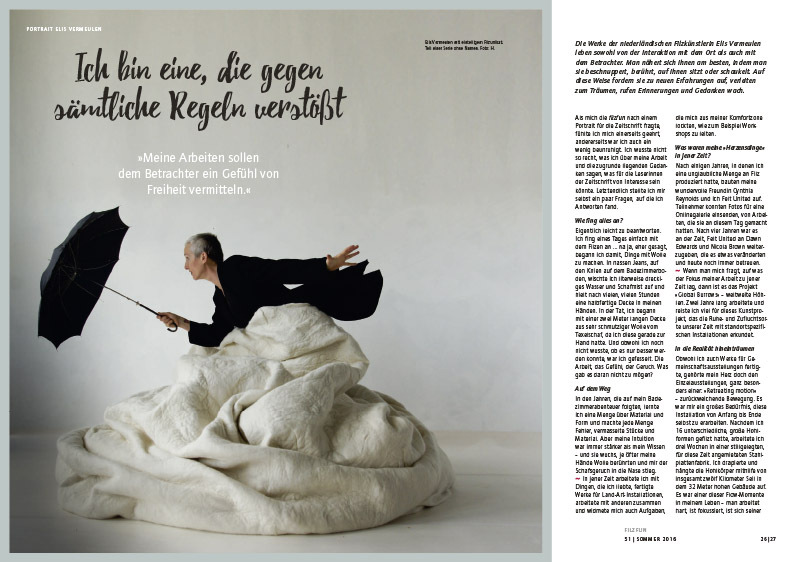 The heart of Ulrike Hartrumpf burns not only for felt, felt also burn for her. The graduate of the Felt School Oberrot experiments with the special aesthetic, that evolves out of the interaction between felt and flames. Mari Paz Rojo has a heart for animals. She has initiated a project to rescue suffering greyhounds in the Spanish Castile. The project is supported with the proceeds of her hand-felted products. Ruth Bucci-Baumer also has a big heart, for children though; she spends several months a year in Thai orphanages and felts wonderful projects with the children. and its framework program also included enough time for creative felt exchange. In Oslo there was an exhibition with creations by Scandinavian felt artists, in the Netherlands felting and quilting came in contact with each other. »Far away – close by« is the title of an exhibition that offers an eclectic insight into the creative work by Annemie Koenen. Susanne Breuling trained as textile designer (craft trades), specializing in felt and she came to her dream job with felting. Catrin Porsiel fell downright in love with the curls of the German Karakul sheep. Their welfare is very important to her. The participants of the textile journey visited very special places and people in India. Far from the cliché of holiday packages, they had great insights into the life of this fascinating country. 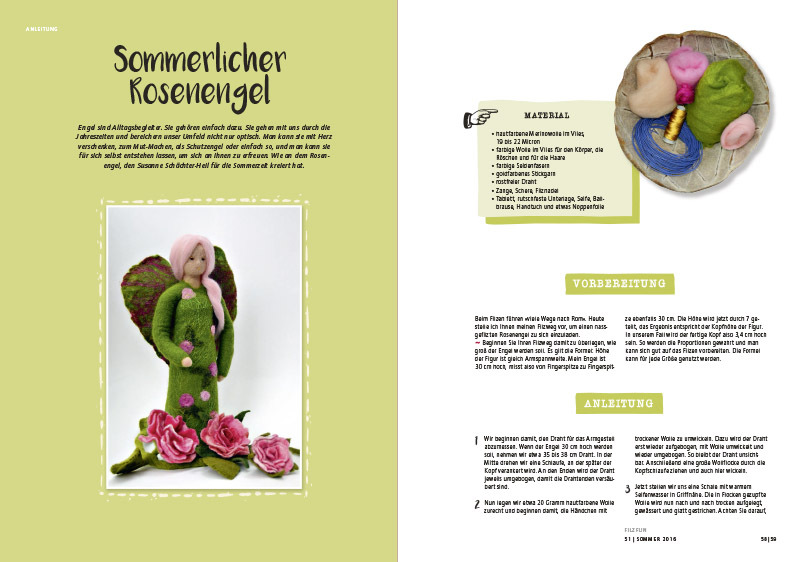 If you would like to begin working after all this inspiring reading, you can make the summery Rose Angel by Susanne Schächter-Heil and create a new adorable summer guest.